Constructed: 1940 Demolished: 1945 The United States involvement in World War II, from 1941 until 1945, produced the most dramatic growth in the Fairfield area. Fairfield received lucrative defense contracts for cargo ships and other military commodities. In 1940, the U.S. Federal Works Administration chose Fairfield as the site for the production of Liberty Ships. By taking over the Weyerhouses, Union Shipbuilding, Gulf Oil, and Raision Monumental Chemical properties, the U.S. Government assembled the largest shipbuilding yard on the East Coast. 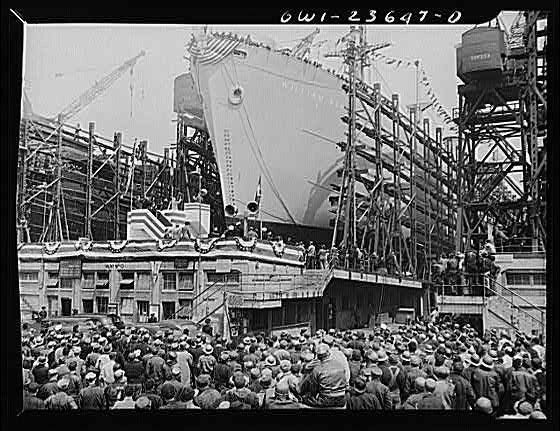 In 1941, a few months before the United States entered World War II, the SS Patrick Henry, the first U. S. Liberty Ship, was built and launched from the Bethlehem-Fairfield Shipyard with President Franklin D. Roosevelt in attendance. During the peak years of ship construction, nearly four hundred ships were built in this area. Bethlehem Steel Corporation Shipbuilding Division managed this immense operation until the end of the war. Vacant land was used to support the war effort, industry was expanded, storage yards for shipbuilding were founded, and new housing for the wartime workers was constructed. Migrants from the U.S. South began to move to the area to work in the wartime industries. Fairfield Homes, which was designed to become public housing after the war, linked the disparate communities in one contiguous neighborhood. After the war industries were returned to the original owners and the boom ended in Fairfield. The war’s end was the beginning of a disinvestment in the Fairfield neighborhood.